Without the ability to adapt quickly to changing fashion trends, major retailer HR Group risked carrying unsold and discounted stock. How could HR Group determine – or even predict – shifting tastes? 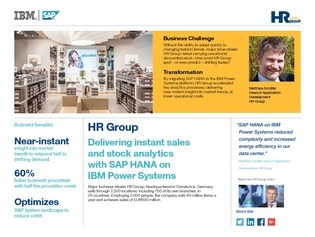 By migrating SAP HANA, HR Group accelerated key analytics processes, delivering near-instant insight into market trends. Access this case study to learn more about how HR Group realized 60% faster business processes with half the processor cores.